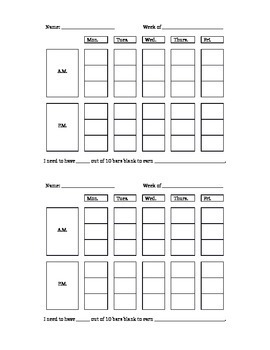 This half-sheet tracking form can be used to manage behavior of individual students. Although I used this with 1, 2, 3, Magic, it can be modified according to the students' needs. This sheet can be used in many ways. You may decide to fill a box if the student stays on-task during a morning/afternoon activity or you may decide to color in a box if a student exceeded a set number of reminders. Before implementing, discuss with the student how it will be used and what the criteria will be to earn a colored box. Each week, set a goal with the student of the number of boxes they need colored or uncolored to receive an incentive.